We really enjoyed the time with my family in Baan Paradise Villa. The villa is luxury, comfortable, friendly & warm. The butler, chef and maids are very nice! They also provide the security guy during night. It's very safety! The host who has good taste cares about each corner. We had excellent experiences on using the high technology for controlling the lights, TVs, air condition, musics played in every corner by using cellphone. High quality & luxury kitchen supplies including the coffee cups & towels etc. Famous branded coffee capsule available. Thank you to the butler for the beachfront dinner which brings us amazing memories. We'll come back next time for the dream villa! Have been to Kho samui with 6 other friends and family for the new years and baan paradise is our favorite place in the whole trip. Same or better than in the pictures. Right on the beach. Modern, with all amenities, well kept villa. The staff were very friendly and helpful. 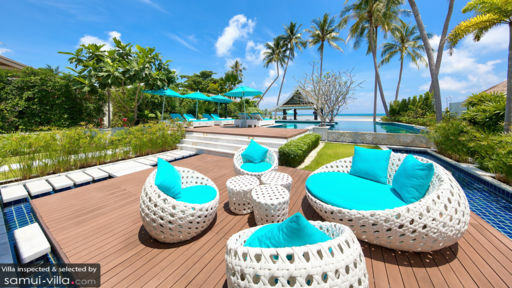 It is right next to shiva samui resort so the access to restaurant is also easy. If I go back to Kho samui, I would like to stay there again. My friends and I booked Villa Baan to celebrate a birthday. 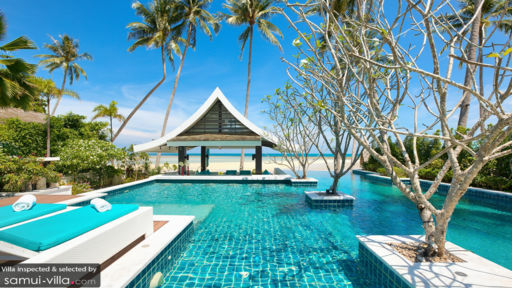 We chose it because we wanted to celebrate in Koh Samui, but we ended up spending all our time in this amazing villa. It is right on a beautiful deserted beach, the tide is quite strong and so at every moment of the day you have a different view. The villa itself is perfect, we sadly stayed only 4 nights which was not enough to appreciate all the small details. We had all our lunches sitting at the table above the beach, I don't know if it was the perfect position or the delicious lunches cooked by the chef, but every meal took us more than two hours to finished, it was just pure enjoyment. The pool itself is really cool, you have the feeling to be in a resort with a bar and stools in the pool, except of course this amazing luxury is for you and only you. The bedrooms have been decorated with the same attention of details and the bathrooms and amenities complete this picture perfect villa. We would really like to go back, it just seems one of this place where all your concerns melt away and where you are just grateful for being there.